Lately, I found out that Django’s TransactionTestCase leaves test data in database after the test case is executed. It’s not until the next execution of _pre_setup method of a TransactionTestCase instance that the database is flushed. This is troublesome when tests are run with Django Nose’s test runner with REUSE_DB =1. An easy fix to this is to customize the TransactionTestCase so that it deletes the test data on exit. I wrote a simple wrapper around Django’s TransactionTestCase and extend it to write other transaction test cases. 2012-06-29 13:01:45,731 tx DEBUG Resource Resource1: New ResourcePriority created. It does not tell anything about which app generated the logs. In a first glance, fixing this looks pretty straight forward and dumb. All it needs it to customize this https://github.com/transifex/transifex/tree/devel/transifex/txcommon/log module for each app and instead of importing the logger from txcommon.log, import it from the log module inside the app. Receive signals for objects with a .name attribute. and finally, log the event. Sets logger name to show calling app's name. # of cls.debug() or other logging method wrappers. 2012-06-29 22:15:07,661 tx.releases DEBUG release: Checking string freeze breakage. Thanks for reading. If you have any suggestions or query, please feel free to comment. A Django app used to add true plug-n-play functionality to your own Django applications and projects. Django-addons is brought to you by Indifex, the company behind Transifex. Django-addons is a bunch of code that makes writing addon/plugins for your Django project much easier. Add django-addons to your Django project and you can drop all the addons to ‘/addons’ directory. Lately, I have been working on a bunch of exciting new stuffs for Transifex. I have worked on a tag-cloud implementation which not only shows the popular tags, but also shows tags related to a tag selected by the user. It is pretty useful. It directs the user to select more relevant tags. The tag cloud is refreshed each time the user makes a selection to show the related tags. I built this on top of the django-tagging module. I wrote a model to represent a tag as a node in a graph. The model includes all the tags related to it (that is tags which appear with the tag in concern) as adjacent nodes along with the weight (that is number of times the two tags appear together) of each edge between two related tag nodes. This data is updated and synced as necessary, e.g, after a project is added or updated. 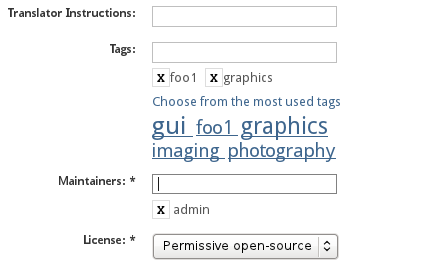 Now, whenever a tag is selected, the tag-cloud is refreshed to show the related tags. The font-size of a related tag is decided by taking into consideration both the weight of an edge it shares with the selected tag and its count. Below is a sample use case for related tag-cloud in Transifex. Now, he selects a new tag ‘graphics’ and the tagcloud is refreshed to show the tags related to ‘graphics’. Such small things together can really take the user experience to a new level. 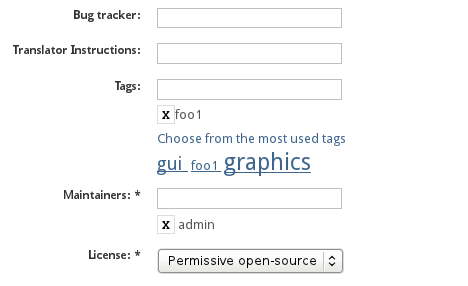 By implementing related tag-clouds, we enable the user to choose relevant tags in a better way. At Transifex, we innovate to help people localize in a better way :).